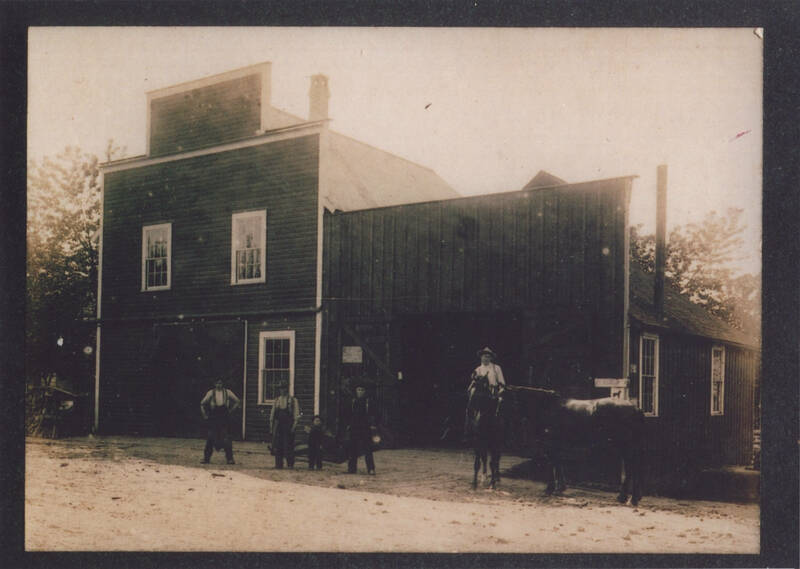 A sepia-toned photograph of four adult men, one child, and two horses standing outside the John Gaarde Blacksmith Shop. John Gaarde is the second man from the right and is standing next to his son Hans Gaarde. The man on the far left is Al Johnson. An unidentified man on the far right sits on one of the horses. The shop's buildings each have western style false-front facades and a wide bay door on the ground floor. The building to the left is a two-story building with two double-paned windows on the second floor and one on the ground floor. The building to the right is a one-story building. Two double-paned windows are visible along the side of the building and a chimney extends upward from the roof. John Gaarde established his blacksmith shop in Tigardville in 1893. The shop was located on present-day Pacific Highway, across from McDonald Street. John Gaarde's shop and Charles Tigard's general store and post office were at the center of Tigardville's early commercial activity.